← A small spot on 16 miles. I won’t be passing out the cigars yet. I thought I was a grand-mama. 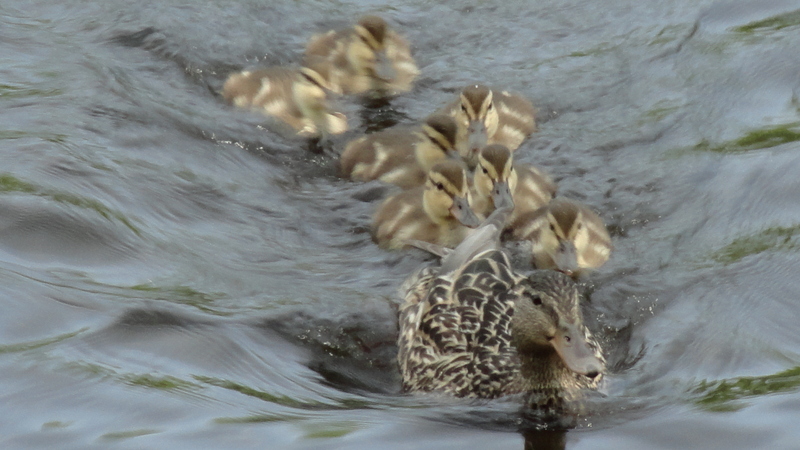 Early yesterday morning I was greeted with seven ducklings following Mama in a straight line. I was thrilled! 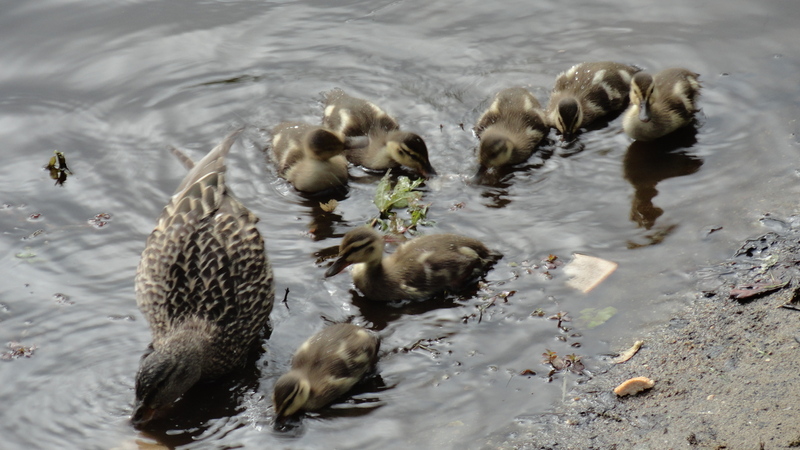 My iPhone was on fire as the texts flew out– Mama had her ducklings and I’m a grandmother! Well, as the day progressed, I noticed Mama was hanging around without the kids. She was eating, sunning, swimming, chatting with Daddy. Hmmmmm, where were they? A little research and I found out the hen might leave the ducklings for a short time to go off and feed. But this wasn’t a short time. This was a day at the spa. Did the babies get eaten by a snapping turtle? Hawk? At dusk, Mama and Daddy came by for supper and then went off across the river to bed. 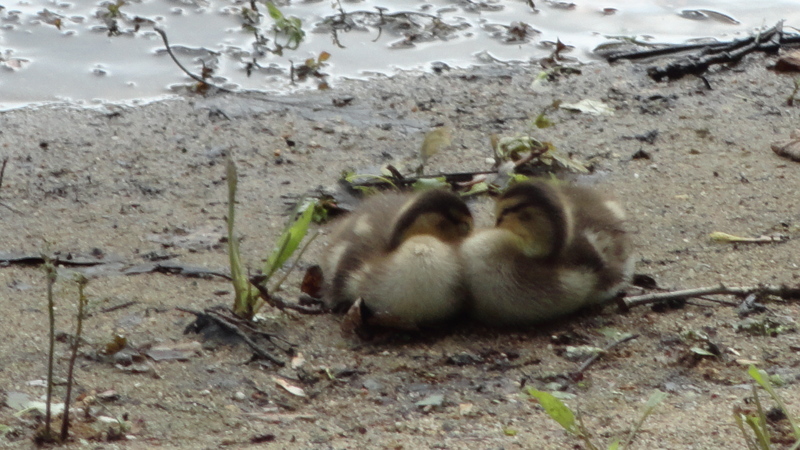 Perhaps the ducklings were already asleep on the nest, safe and cozy. Today, I was up early. Had to get Sparky to the groomer and do a Lowe’s run. Returning home around noon found snoozing babies on the beach with Mama close by. Okay, at least I knew the ducklings were still alive and well. 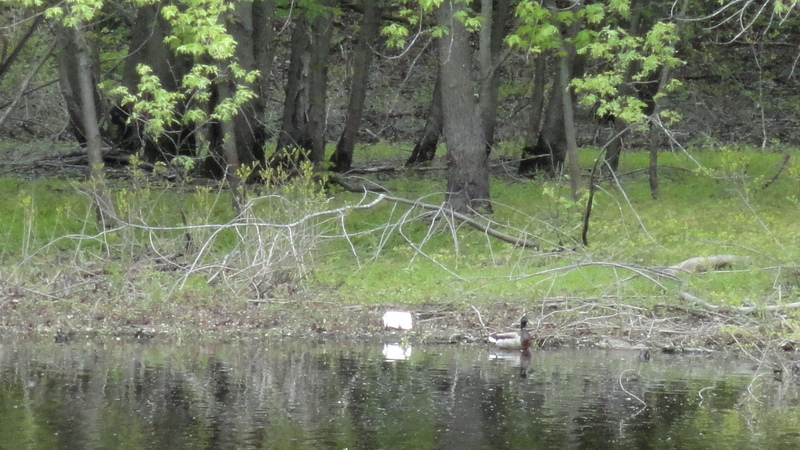 Mama seemed to have everything under control, and, since I wasn’t a duck, I decided to leave the worry to her. About 20 minutes later, Mama came onto the lawn, quacking loudly, as if to say “Where the heck is lunch?” Chris asked, “Where are the baby ducks if she’s here on the grass?” “I don’t know, they must still be on the beach.” Well, you could have knocked me over with a feather, and it didn’t have to be a mallard feather either. There was another hen with the ducklings. These babies didn’t belong to Mama or Daddy! Then the commotion started. Daddy tried to come onto the beach for lunch and Mama2 attacked. They fought like warriors. Finally Daddy headed across the river and Mama2 herded the ducklings into the brush. All the while, Mama ate quietly before swimming across the river to join Daddy. Now, I’m not an expert on animal behavior or mallard ducks. However, I have done my research and according to many trustworthy sources I’ve learned a thing or two. First, drakes will only stay with the hen until the eggs are ready to be incubated. Then he leaves looking for another nest to feather. So, unless Mama hasn’t even laid her eggs yet, Daddy seems to be hanging around much longer than usual. At dusk I can see him across the river, guarding the nest and keeping Mama safe. I’ve also learned hens allow the ducklings to eat first. Not here. Mama2 squawks at the babies and pecks at their tails to keep them away from the bread. So much for textbook animal behavior. 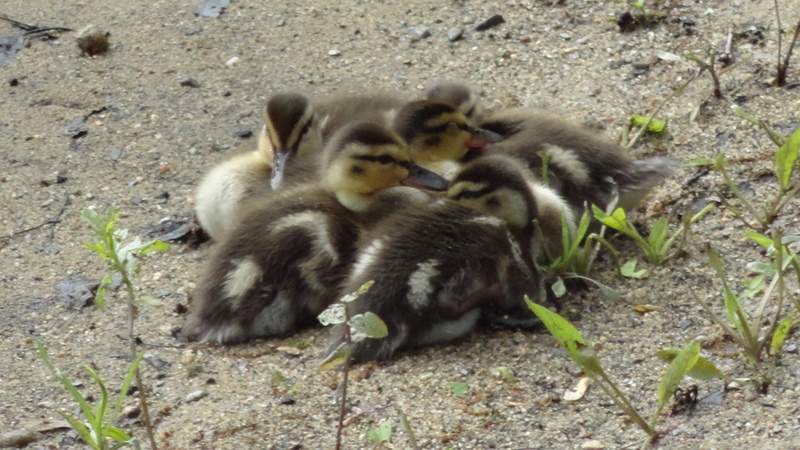 This entry was posted in Life on the Concord River and tagged animal behavior, ducklings, grandmother, hens, iPhone, Lowe's, Mallards, nest, river. Bookmark the permalink.